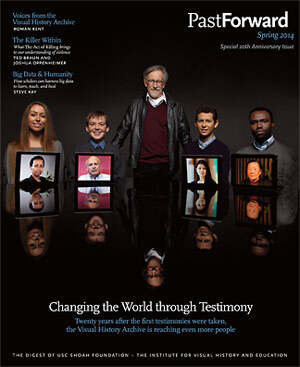 The annual digest of USC Shoah Foundation, PastForward contains articles written by researchers, teachers, students and more who are interacting with the testimonies in the Visual History Archive, as well as letters from founder Steven Spielberg and Executive Director Stephen Smith. The publication launched in 2001 as an Institute newsletter. In 2010, it was rebranded as an academic digest.